We’d love your help. 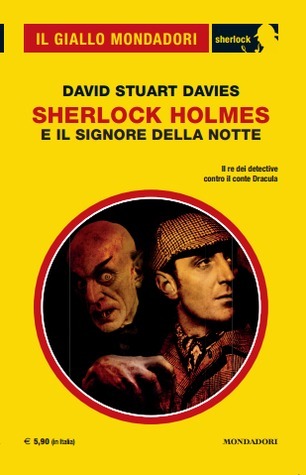 Let us know what’s wrong with this preview of Sherlock Holmes e il Signore della notte by David Stuart Davies. To ask other readers questions about Sherlock Holmes e il Signore della notte, please sign up. A few times on GR I have come across those wonderful reviews where people have had celebrity fights between Jane Austen and Hamlet or Alice in Wonderland and Little Nell etc. They always make me laugh and show me again adn again how clever Goodreads reviewers can be. David Stuart Davies wrote this story in 1992 so long before those reviews began to appear but I am not quite certain whether his novel was an extended ahead of the game celebrity death-match in which Holmes and Dracula slug it out o A few times on GR I have come across those wonderful reviews where people have had celebrity fights between Jane Austen and Hamlet or Alice in Wonderland and Little Nell etc. They always make me laugh and show me again adn again how clever Goodreads reviewers can be. David Stuart Davies wrote this story in 1992 so long before those reviews began to appear but I am not quite certain whether his novel was an extended ahead of the game celebrity death-match in which Holmes and Dracula slug it out or whether it is a genuine attempt to bring two great characters together in one story. In an anthor's note at the beginning he relates how he has come into possession of Watson's journal and from this he has fleshed out the novel we now read. Holmes and Dr Watson struggle through myth, scepticism and confusion as they encounter, battle with and ultimately defeat the Lord of the Undead. Throwing into the mix, none too believably, the miraculously escaped Hound of the Baskerville trainer Dr Stapleton who didn't actually drown in Grimpen Mire the first time, a guest appearance by Dr Van Helsing himself, assorted Brides of Dracula and the normal Inspector LeStrade and Mrs Hudson, the story trundles along at a merry old pace and though there is a tendency for the breathless ' and with one leap he was free' type plot movements it is quite fun. I love that. How stiff-upper-lippy can you get. Dr Watson's inability to stop opening cupboards or leaning to close to Brides of Dracula or even, for the love of God, opening coffins from which he hears pleas for help does get a little ridiculous. I mean for crying out loud John, you have o'levels and everything; think man think. 'This was no unfortunate cruelly imprisoned by our enemies; I had been tricked, this was a blood-lusting vampire'....oh really, who would ever have thought it. Nevertheless having read it I am still not 100% certain whether i am supposed to have taken it seriously or tongue in cheekly. It is a bit gory, a bit atmospheric, a bit literary and has a good deal of sad eye stuff over frail and fading young ladies but it is fun. Oh and there is a dwarf, I almost forgot the dwarf and then there is a wonderfully silly guest apearance right towards the end as the Count gets his comeuppance, by a crossover character from a previous story. I won't say read it and weep but if you are a little precious about your classics this might not be to your taste. The whole wonder of Holmes' cases are they are all explicable in the world of logic and reason, the whole wonder of Bram Stoker's creation is he is far beyond reason. Does Davies succeed in marrying the two; imo, if it is a serious work then no but if it is a gentle spoof/homage then perhaps. A very brief synopsis that made me wonder how seriously to take this book (though it was a relief after Dombey & Son). Do people really take the ancillary fiction of major characters seriously? (And I know that with Sherlock Holmes there is a lot.) Is this not something I might have seen in a Scooby Doo episode once upon a time? Thinking about it, isn't there actually a film with the same idea? To be fair the book is a gripping, if undemanding lead. It functions as Sherlock Holmes vs Dracula. To be fair the book is a gripping, if undemanding lead. It functions as a sequel to Hound of the Baskervilles, with Holmes and Watson returning to Devon to fight the Transylvanian count. 4.5 stars. Interesting worlds colliding! Great fun. This book was gathering dust on my bookshelf and I cannot believe I waited ‘til now to read it! I am usually a fan of mystery and detective related books and it is a wonder how I didn’t pick up Sherlock Holmes ‘til now. I believe it may be because of the egoistic male vibe Holmes gives out, hah. This book is the second book in the series; it talks about Holmes’ encounter with the phantom lady and the infamous Dracula and how Holmes escaped death several times (this shouldn’t be a spoiler alert b This book was gathering dust on my bookshelf and I cannot believe I waited ‘til now to read it! I am usually a fan of mystery and detective related books and it is a wonder how I didn’t pick up Sherlock Holmes ‘til now. I believe it may be because of the egoistic male vibe Holmes gives out, hah. This is a crossover book combining Sherlock Holmes with characters of another author. A nice touch is the introduction by the late great Peter Cushing who I remember as Holmes from 1968, and doubly qualified by one of his legendary film roles. This Big Finish Production is many things. It is a sequel to Hound of the Baskerville, in that it features several of the main characters from that story. It is also Holmes Vs. Count Dracula. It is a good but not great story. When a device arrives at 221B Baker Street that was meant to kill him, Sherlock Holmes sets out to investigate. He is captured by an old adversary from an earlier case whom he had long thought dead. At the same time, a woman arrives at Baker Street and tells Watson that Holmes is walking into a trap. Fortunately, Inspector Lestrade shows up right after she leaves to ask for his aid in solving some very strange deaths and he and Watson are able to rescue Holmes. Lestrade’s case involves some very When a device arrives at 221B Baker Street that was meant to kill him, Sherlock Holmes sets out to investigate. He is captured by an old adversary from an earlier case whom he had long thought dead. At the same time, a woman arrives at Baker Street and tells Watson that Holmes is walking into a trap. Fortunately, Inspector Lestrade shows up right after she leaves to ask for his aid in solving some very strange deaths and he and Watson are able to rescue Holmes. Lestrade’s case involves some very unusual murders linked to a phantom woman who is only seen at night. What particularly interests Holmes is the proximity of the deaths to Baskerville Hall. As he and Watson investigate, they meet the famous vampire hunter, Abraham Van Helsing who tells them that Count Dracula has taken up residence somewhere in England and suggests this may have some bearing on their case. Holmes and Watson are, not surprisingly, somewhat skeptical of this claim but the more they investigate, the more they are convinced that he is right, especially after they encounter the woman. And the more they investigate, the more it seems that this new case is somehow linked to the old adversary. I am not quite convinced that pitting Sherlock Holmes, that most rational of fictitious detectives with Dracula as author David Stuart Davies does in his novel, Sherlock Holmes and the Tangled Skein, works. Still, if it’s to be done, Davies has chosen the right setting and original Holmes story to serve as backdrop. The Hound of the Baskervilles is, to my mind at least, the most gothic of Conan Doyle’s tales with its dark brooding mansion on the forbidding moors - a setting just guaranteed to raise shivers and which allows for the presence of supernatural elements whether it’s a phantom dog who howls (or doesn’t) in the night to herald a death or vampires. That aside, this is a well-written tale and an enjoyable read although it would probably appeal more to fans of vampire stories or the paranormal than fans of the original Sherlock Holmes books. 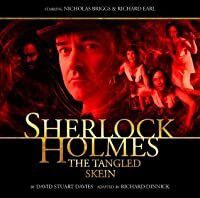 Sherlock Holmes and the Tangled Skein” eBook was published in 2016 and was written by David Stuart Davies (http://www.davidstuartdavies.co.uk/home). Mr. Davies has published more than a dozen novels, with this being his sixth Sherlock Holmes novel. I received a galley of this novel for review through https://www.netgalley.com. I categorize this novel as ‘PG’ because it contains scenes of Violence. The novel is set in 1888 London and surrounding areas. The primary characters are Sherlock Holmes a Sherlock Holmes and the Tangled Skein” eBook was published in 2016 and was written by David Stuart Davies (http://www.davidstuartdavies.co.uk/home). Mr. Davies has published more than a dozen novels, with this being his sixth Sherlock Holmes novel. The primary characters are Sherlock Holmes and Dr. John Watson. This is a follow on to the well known Hound of the Baskervilles story. While not involving any of the Baskervilles directly, it does primarily take place in that area of England. An odd package arrives at 221B Baker St. and it turns out to be a device intended to kill Sherlock Holmes. This prompts Holmes to investigate its origin. Inspector Lestrade comes to ask for Holmes and Watson to help with murders that have happened on Hampstead Heath. These deaths seem somehow tied to a strange phantom lady seen in the area at night. The investigation take a turn for the paranormal when Holmes and Watson, while pursuing the phantom lady, are rescued by Professor Van Helsing. It is his theory that the phantom lady is a vampire. Not only that, but that Count Dracula has come to England to create a local vampire colony. As expected Holmes and Watson are skeptical of Van Helsing’s claims and continue with their investigation. That leads them to the area of the Baskerville home and their attempt to save a young woman from falling to an evil illness. Watson and Holmes face danger and death more than once in this tale of mystery, facing one of their most clever adversaries. This was a quick read taking less than five hours for me to complete this 192 page novel. It was a well written story and matches the style of Sir Arthur Conan Doyle. I somewhat regret reading it only because the genre (vampires) is really outside my interest area. I give this novel a 4 out of 5. This review has been hidden because it contains spoilers. To view it, click here. This is basically Sherlock Holmes versus Dracula, and how you react to that capsule description will tell you most of what you need to know about how you'll feel about the play. My own reaction was more or less, "Well, the two don't really seem to belong in the same universe, but it could be fun." The story starts off with Holmes dealing with an adversary who's trying to kill him, and who nearly succeeds a couple of times. The plot then takes a turn as Holmes and Watson suddenly have to deal wit This is basically Sherlock Holmes versus Dracula, and how you react to that capsule description will tell you most of what you need to know about how you'll feel about the play. My own reaction was more or less, "Well, the two don't really seem to belong in the same universe, but it could be fun." The story starts off with Holmes dealing with an adversary who's trying to kill him, and who nearly succeeds a couple of times. The plot then takes a turn as Holmes and Watson suddenly have to deal with the more pressing threat of vampires. Of course, the two plots turn out to be connected. Although I find myself wishing that they'd been connected in a more interesting way, or that the original adversary had remained more central to the story, because I thought he was actually more interesting than Dracula. The final showdown between Holmes/Watson and Dracula is suitably dramatic, though. I like Nick Briggs and Richard Earl as Holmes and Watson, and I thought the more traditional Holmesian parts of this were quite good, so I'll definitely be checking out other titles in Big Finish's Holmes range. A clever mixture of Conan Doyle and Bram Stoker. The Great Detective confronts Dracula in a sequel to his famous Baskerville adventure. This audio drama is a faithful adaptation of David Stuart Davies' novel. In many ways an excellent Sherlock Holmes story combined with a reasonable Dracula one, very true to the events of Hound of the Baskervilles but quite divergent from the classic Dracula story. The fights with the vampires are exciting and dramatic but lack realism. As always Big Finish have A clever mixture of Conan Doyle and Bram Stoker. The Great Detective confronts Dracula in a sequel to his famous Baskerville adventure. This audio drama is a faithful adaptation of David Stuart Davies' novel. In many ways an excellent Sherlock Holmes story combined with a reasonable Dracula one, very true to the events of Hound of the Baskervilles but quite divergent from the classic Dracula story. The fights with the vampires are exciting and dramatic but lack realism. As always Big Finish have produced this to an excellent standard of acting, music and sound-quality. Sherlock Holmes vs Count Dracula. How could anyone pass this up? Well part of me wishes I had and yet I am glad I didn’t. Can you tell I am on the fence about this book? Written originally in 1992 apparently this is a re-release. Any fan of SH should pick it up just to be sure they have read them all but don’t expect this SH to be what AC Doyle’s originally wrote. Sherlock Holmes and the Tangled Skein by David Stuart Davies is another Sherlock pastiche. Some of these are great; some not so much. This one falls somewhere in between. I simply couldn't resist the Dracula element. Holmes vs Dracula drew me in, and Davies does a decent job with it. A quick and enjoyable read, but not my favorite in the realm of Holmes and Watson. Mystery/Supernatural. 2007; 2016. Print length: 192 pages. When I found this to be a Holmes vs Dracula story I set it aside thinking it would be commercial tribal at best. However, I eventually read it and was both surprised and delighted. I believe that both Sir Arthur Conan Doyle and Bram Stoker would have been pleased with the in suing result. Well played, well played indeed. haydn42@live.co.uk Another Holmes and Watson story from Stuart Davies, with all the authenticity of Conan Doyle. A rather silly story that stretched credibility to its furthest, but in the end Good, represented by Sherlock Holmes, overcame Evil, Dracula, with the marvellous interplay between Holmes and Watson in between. A few authors write 'Sherlock Holmes 'stories, but for me Stuart Davies beats them all. This was a really fun read, especially after reading the Hound of the Baskervilles. Quite fun to have Holmes and Dracula in one book! The only weird part for me was that Van Helsing wasn't more involved - it just didn't feel right to have a key Dracula character shunted so far off to the side lines. I understand that it's more of a Sherlock Holmes novel, hence Holmes and Watson are the key players, but it would have been fun for Van Helsing to pop in a bit more often. I really enjoyed this book. I am a lover of all things Sherlock Holmes/John Watson and this book didn't disappoint. Mystery, a bit of the supernatural, calm cool reasoning. Fantastic. I recommend this book to lovers of mysteries, period pieces and Sherlock Holmes. This is a quick, smooth read and a good time; fair warning that this is probably not one of the top Doyle and Holmes homages but it is pretty serviceable. Would recommend for fans who wanted the Hound to be a demon from beyond the grave. I kept reading hoping it would be a typical Holmes mystery, yet it turned into a sci-fi book with a paranormal plot. I was disappointed there was no clever explanation/resolve to the story. If you're a Sherlock Holmes fan, I wouldn't suggest this book. If you like vampire-centered plots...this would be ok.
Sherlock Holmes and vampires, seemed like a good idea, and while it's written just as a Conan Doyle story, I find the setting gets a little weird towards the end. Big Finish Productions did a great job as always in my opinion, they hook you into the drama very well. Good follow-up and sequel to "The Hound of the Baskervilles," which didn't really need a sequel, but what the heck. There have apparently been several attempts pit Holmes against Dracula, and this is . . . one of them. But it's not all about the gimmick, and plays off plot threads from "Baskervilles" quite well. Despite the outrageous subject of this story, it works. One feels that this tale was an original Sherlock Holmes story. It is well-written and turns out to be very believable as a Watson product. I was skeptical at first, but I enjoyed the adventure. I loved this book even though Dracula was in it. I love anything Holmes and Watson, I recommend this book to all that love Sherlock Holmes. On beyond bad. Read like a not-particularly-good fanfic by a middle-schooler. Violated both Holmes canon and Dracula canon. Made up new rules for killing vampires. Actually gave Dracula a *dwarf servant. * Can you get any more "bad cliche" than that?